The Day I Told My Kids "I Quit"
I told my kids “I quit” and you won’t believe what happened next. It was an ugly day. Scratch that, it has been an ugly season. I honestly can’t remember the last day that a door was not slammed, a foot was not stomped or a voice was not raised. It’s pretty common knowledge that I have one son that struggles with intense emotions, but this has been different. All of the children have been on edge, despite all my best efforts to change the equation. Before you hate me and think I am the worst mom in the world, I want it to be very clear, that I have never and will never attempt to tell you the “best” way to parent. This is not a post where I will tell you the secrets to a happy family. Quite the opposite, in fact, it is my goal to create a place where you just don’t feel alone. I am pretty sure I am not alone in this feeling of hitting my limit. That is just what happened. I hit my limit. 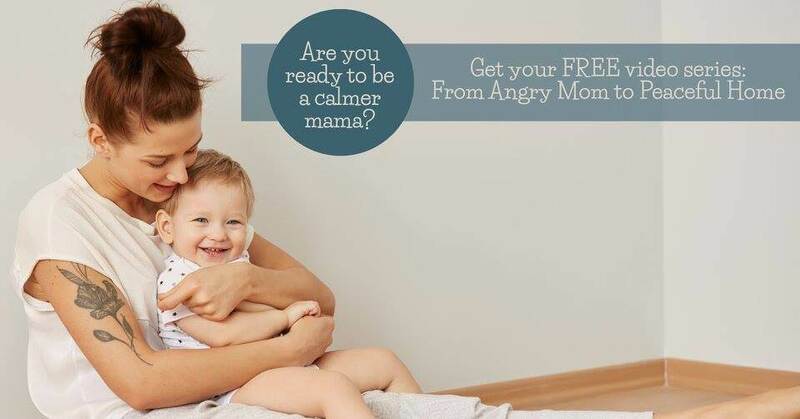 There is only so much yelling, so much stomping and so much screaming this one mom can take! It just wears me down. I have started and restarted my journey to be a more peaceful parent and practice what I preach several times in the last few years. My latest attempts have worked wonders for myself. What I mean by that, is I have found a calm for myself. I have filled my parenting toolbox, implemented strategies that are working and I actually have been yelling much less, if any at all. Despite all those changes for the better, my home is still a war zone. It is not peaceful. It is not pretty. Normally, I vent to my friends via chat or text messages for a moment of validity. Sometimes, I call someone after the kids are in bed to find support. And I always lean on my husband for support when the day is done. However, my kids never see this. I am living a lie. 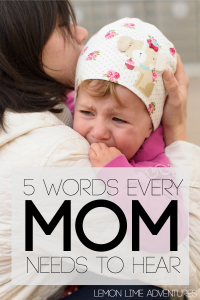 In front of my kids, I say all the “right” words. I give all the “right” consequences and I remain consistent and fair. My voice stays calm and my mood remains flat. Not overjoyed but not angry. I let the anger roll off my back and save the sadness for behind closed doors. My kids have no clue how unhappy I am. 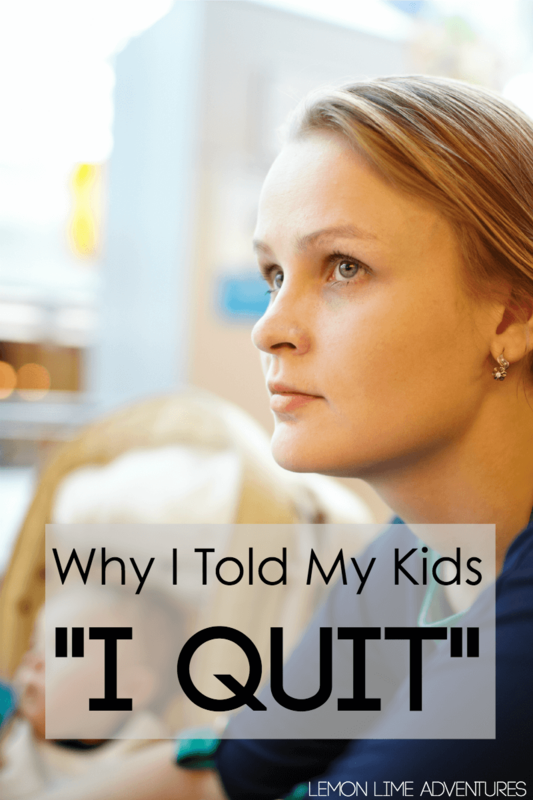 Today, I told my children “I quit“. I was broken and they could see it. Tears started streaming down my face. I told them of the love I have for them. I told them how much I care about them and how no matter what, I would always love them, but something had to give. I didn’t have a long drawn out speech, because, honestly, they wouldn’t have listened. Instead, I told them how I felt. I told them how it hurt that I couldn’t remember a day of no yelling. I told them it broke me. I told them I felt like a failure. I told them I couldn’t keep going like this. I know, I know… you are probably thinking to yourself “Wow, how could this mom put so much on her children? Wow, get a life, woman.” Right? Well, even if you are, I am here to share something truly amazing that happened next that pretty much floored me. I walked away for my break, my breather, and my quiet time. I went to unload the dishes and left the kids with my words. I expected them to brush it off and go about their day. I expected the arguing to start right back up. Honestly, I expected nothing to come of it and I felt awful for letting it out on them. Yet, as I stood there unloading the dishes with a toddler wrapped around my legs, I could hear something happening in the other room. The boys were calm. They were gentle. In fact, they were working. They both got out their schoolwork on there own. They both finished their work on their own. They both made their snacks on their own. And you know what? It didn’t end there. No, in fact, it continued through the rest of the day. I have to say it was one of the most peaceful days we have had in a long long time. So, who knows, maybe all it takes is a little tiny bit of brutal honesty to reset. Maybe all it takes is respecting my children enough to tell them how I really feel. Maybe, just maybe, this is the start of something new. Here’s to a day with no yelling, no stomping, and no screaming. I have done this very thing. I am a parent of an Autistic pre-teen boy, who in addition to Autism has ADHD, and that combo makes navigating through things challenging for everyone on a daily basis. I have reached my limit a few times when the stomping, yelling, and constant battle of wills gets to be too much. I wish my “I Quit” had been as successful as yours, but I both understand and support your reason for needing it. Sanctimommies need to remember we are ALL human and have our breaking points. So many times I have woken up and said to myself “Today will be better, today will be better..” Some days are good, and some days are worse. Thank you for this look into your life, I can definitely relate to every single word. this article could’ve been written by me word for word. I have lived thru many days of my “intense” son doing those exact same things and me throwing in the towel when I reach my breaking point There have been times when I will simply go for a walk staying within sight of the house where they can find me and let them fight and scream as loud as they want!! !lol I know that sounds bad but sometimes a breather and a talk with God gets me back on track. Just recently I was telling my husband that I don’t think there’s anyone that endures this kind of behavior but your post has shown me otherwise! Thank you for being real. Years and years ago, my son had pushed every button, my daughter was being a typical teen age girl with attitude as big as the hair in the 80’s, my son stepped over the line and my husband, who has the patience of a saint, engaged in an one-side conversation with the boy child. When the conversation was over, the words, I quit where used, he grabbed his keys and left…they kids freaked out and jumped in my daughters car and went looking for him. Saw a difference in them since. They still talk about that day. I related to everything you said! Thank you for having the courage to put it out there. My breaking point was about two weeks ago when I told my kids I was done trying to control their behavior, that it was their choice. With my husband supporting me with heavy artillery, I was able to walk away and get control of myself. I discovered I was not setting appropriate boundaries around myself and not allowing my kids to be responsible for their own choices. Best wishes for continued peace in your house! My very smart 3 year old thought it to be very funny to get into the candy and it the last cupcake while I was putting baby down for his morning napn. I repeatedly told her she could have it after dinner. We had been having problem like this with her not listening and doing what we asked her to do and hurting others. This was the breaking point. I calmly sent her in her room to lay down then I went in the play room and packed up a good amount of her toys. She was very unhappy about this, I expla to her when she could start listening and doing what I ask the first time she would start to get her toys back. It really worked. And she got her toys back. REAL WORDS FROM A REAL MUM! You are teaching your children empathy when help them to understand the feelings of others (you in this case). You are teaching them the value of honesty in a relationship when you tell them exactly how you feel. You are teaching them their actions have a consequence. So much good is happening here. Be proud of yourself for having the courage to tell them how you feel. Be proud of them for understanding. Your job is not to make sure your children live a happy rose colored life. Your job is to teach them to be kind, gentle, caring people who will have strong loving relationships, be good workers, fair employers, and good citizens. And most of all remember you are a woman, mother, friend, wife, daughter. You are many things and you do have a life. It is okay for your children to know these other sides of you. You are a person just like them. My kids r 4 & 2, I am very open with kids about how I feel with what they do..I make it clear with my tone, sad voice, or anger (not hitting) whatever I feel I communicate with them..u need to be honest with kids..at their level they can’t understand if u say I m depressed but they understand what is sad or if u say that is going to make mom cry..or i tell my son that if u make me overwork in home then I will get older soon..and he starts helping.. Thank you. Like you said, I wouldn’t want to go around doing this everyday 😉 but OH MY GOSH. MAY I JUST THANK YOU FOR *BEING REAL*? FOR BEING *HONEST*? FOR NOT BEING (aka not putting forth the image that you are) PERFECT?! THANK YOU! That’s something that has been bothering me a lot lately, and I just want to let you know I appreciate the courage you had to just lay it all out there b/c it’s REAL LIFE! A LOT of yelling goes on in our house, but that doesn’t mean we don’t LOVE each other; but wow does it bug me when ppl put forth this “zen” image or preach that we shouldn’t yell, cuz YEAH WE KNOW THAT ALREADY, but LIFE HAPPENS 😉 and ppl yell. Love the honesty. In my case, I’m an older adoptive mom of two 9 yr olds who are bright and have very intense feelings. I have no relatives nearby nor anyone to talk to so I could vent a bit. Most times, though married to a wonderful husband, I feel depressed and alone. I have felt what you shared and thought to myself what an inept, horrible mom I must be…. this article and the comments by other moms just made my day. i told my husband today (in front of my kids, 7 and 4) that i didn’t want to parent anymore. 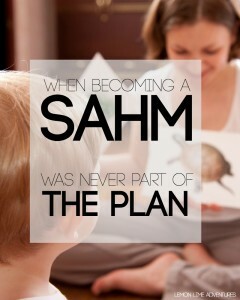 i was in tears and at my wits end with homeschooling my 7 year old who is starting to use a lot of manipulation, and a 4 year old who doesn’t stop whining. I have asked for my husband’s help with coming up with solutions, but he is always too tired. I don’t know how to talk to my kids now, i am still hiding in my bedroom. My husband already made it very clear that he is offended by my words and the kids are, too. I’m struggling with Celiac’s disease and its hard to find a safe place to vent. thankyou everyone for being so honest about your situations.